You know how that saying goes when you get tongue-tied and can't say anything in response to what someone else just said? The saying that goes, "Cat got your tongue?" That's not what these adorable Cat Tape Dispensers will do to you, but they will let you get your tape--and cut it, too. Enough of those allusions to common cliches though. These tape dispensers look incredibly adorable, but don't let their looks fool you because they will get the job done. You can choose from a tabby or a Siamese, or a plain black cat if you're not the very superstitious type. It'll be hard to decide which one to get, though, especially if you have an extreme love for cats like I do. Better yet, just get one for your office desk, one for your home, and one for your best friend. Now wouldn't that be nice? 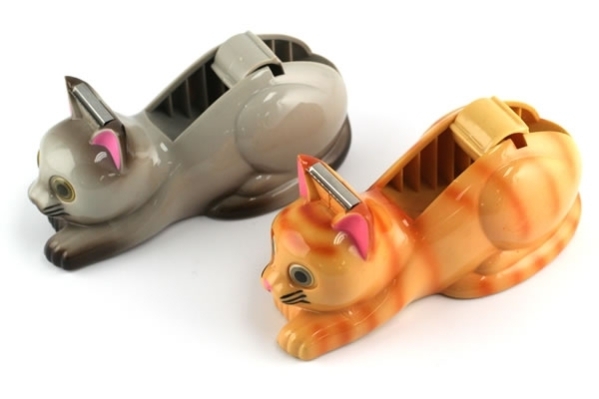 The Siamese and Tabby Cat Tape Dispensers are available from Neatoshop for $13.95 while the Black Cat Tape Dispenser is available from Amazon for $13.99. Which species of these tape dispensers do you like the most? Can Your Pet Be An Insta-Kardashian?